Harrogate taxi fares could be set for an increase. The options are now on the table for how much the district’s taxi fares could rise when a final ruling is made. 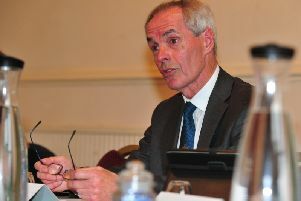 Members of the Harrogate Borough Council Licensing Committee recommended that Hackney Carriage rates should be increased by three per cent, following a request earlier this year by Coun Mike Chambers, Cabinet Member for Housing and Safer Communities that prices should rise. Previously the committee recommended this be a 4.78 per cent increase, while Coun Chambers suggested 2.5 per cent, alongside the starting charge, or flag fall, increasing by 10p. The new recommendation is among six choices that could be finally selected by Coun Chambers on Wednesday, October 24. The current cost of a two mile journey is £6.60, the three per cent rise would see this rise to £6.80. Out of 32 drivers consulted by the council, 28 backed calls for an increase to fares. According to documents put forward by council officers drivers face rising costs, including an 18 per cent rise in insurance and 8.4 per cent for fuel between May 2017 and August 2018. For Kevin O’Boyle, owner of Central Taxis, and longest holder of a taxi licence in the district, says the increase isn’t high enough. He says HBC used to base the increase on a formula used by London City Council and other authorities around 10 years ago, which would have seen prices rise close to the committee’s previous recommendation of 4.78. per cent. He said: “What is being put forward just isn’t enough. The cost of running a taxi keeps going up, and that has to come from somewhere. What that means is you are going to get more drivers putting in more hours than they already are. “A taxi driver already works 60 to 80 hours, that is if they are living purely off that and not topping up a pension or doing it as extra work. HBC has previously stated in a report that an increase of 4.78 per cent could make Harrogate Hackney fares the most expensive in Yorkshire. How much are Hackney fares? According to figures collected by Private Hire and Taxi Monthly, a trade newspaper referenced by HBC, the district was ranked as the 72nd highest in England and Wales for Hackney carriage fares. This was based on the cost of a two mile journey, which came out at £6.43 in August 2018. The same distance in York was £6.80, Leeds £6.40 and £6.00 in Scarborough. The most expensive was London (Heathrow) at £10.40.